Dezeen promotion: a giant ceramic gateway, a flower-filled passage and visions for cars of the future are among the installations and exhibitions set to take place at this year's designjunction. The event returns to Granary Square in London's King's Cross from 21 to 24 September. It will host a series of installations, exhibitions, collaborations and pop-up shops over the four-day period, with brands including Renault, Rado and Tala all taking part. Dezeen is media partner for designjunction, and readers can receive a 50 per cent discount off tickets when purchasing them from the event website. For the first time, designjunction will collaborate with brand Turkishceramics to create a "striking and fully immersive" ceramic installation for the fountain area outside Central Saint Martins. 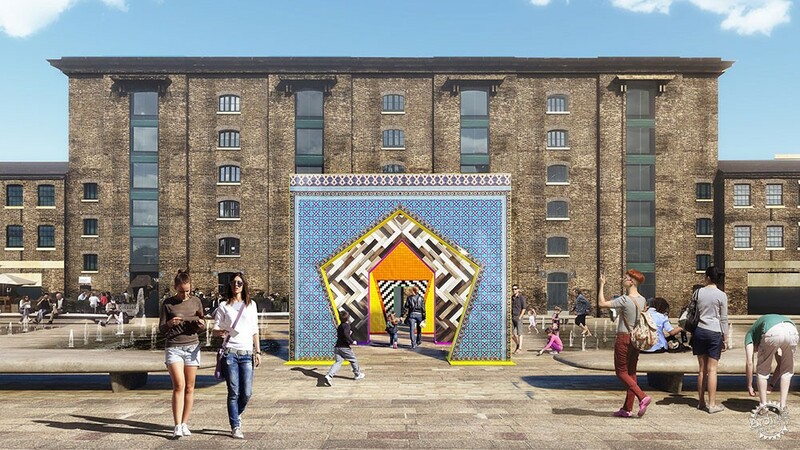 Created by artist Adam Nathaniel Furman, the Gateways installation will consist of a series of colourful, tiled four-metre-high gates – each reflecting a different story based on Turkey's history with ceramics. Also on Granary Square, flower delivery service Bloomon will create a passageway covered in plants from Dutch fields. At the end of the tunnel will be a secret door, which encloses a botanical-themed room that will host talks and workshops. The square will also showcase Renault's self-driving Trezor car, as well as the result of the car brand's collaboration with Central Saint Martins, which saw students challenged with designing a car for the future. Campari – the Italian apéritif – will host a two-week masterclass programme onboard a narrowboat on the nearby Regent's Canal, while lighting brand Tala will serve drinks from a refurbished vintage Mini Cooper. The Crossing, Cubitt House and The Canopy will all return for the 2017 edition of designjunction, as well as a new area named Cubitt Park. The Crossing, which runs through the centre of the Central Saint Martins campus, will again play home to installations and partnership projects, including a collaboration with Rado that will present the finalists' designs for the first Rado Star Prize UK competition. This area will be illuminated by a bespoke chandelier named Helen, Light & Porcelain, designed by two French studios, Blackbody and Haviland. The Canopy will return as a temporary pop-up venue for premium retail brands and emerging design labels, selling everything from fashion accessories to technology, ceramics, glassware and stationery. This year's mix of brands includes Cherchbi, Holdall & Co, Korridor, Melin Tregwynt, Oggetto, One We Made Earlier, Tom Pigeon and Void Watches. 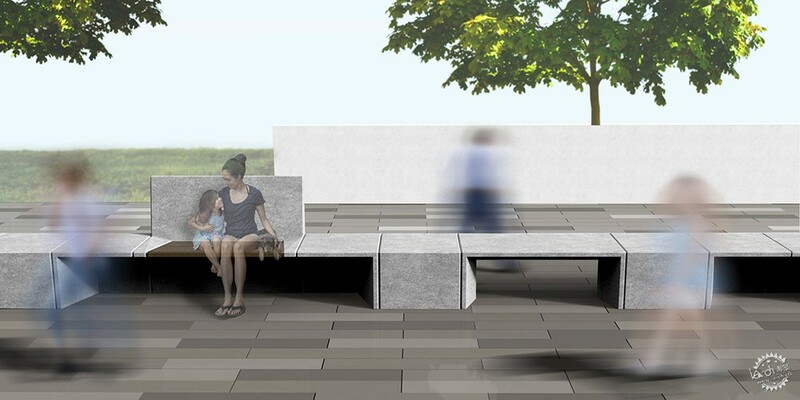 In the new Cubitt Park area, Kirkby Design and Eley Kishimoto have teamed up to create a press area named The Lounge. This space will also play host to several events, including the Blueprint iGuzzini Architectural Photography Awards and an NLA networking gathering. To help visitors navigate around the site, design practice Maynard has devised a wayfinding strategy along with graphic designers BCMH. 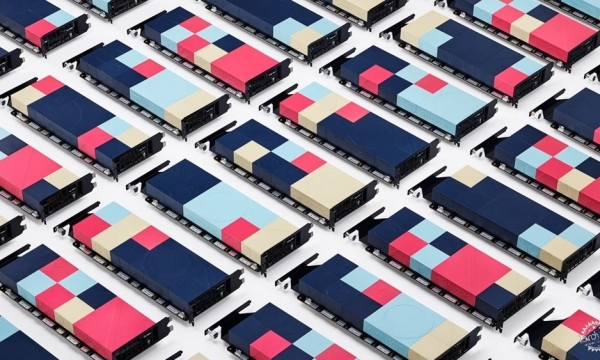 Maynard has also worked with Marshalls to design a new range of brutalist-inspired modular street furniture, including seating, lighting and cycle parking, which will be launched at designjunction and positioned around Granary Square for the event. Designjunction will take place from 21 to 24 September 2017 during the London Design Festival. Tickets for the event can be purchased online in advance for ￡12, while trade tickets are free when reserved in advance. Dezeen readers can receive a 50 per cent discount for tickets through this link to the designjunction website.